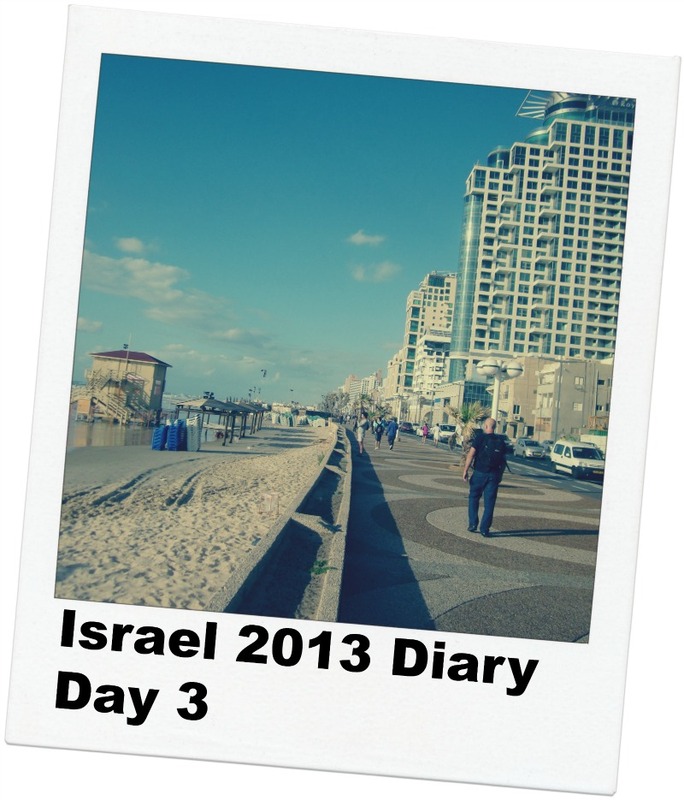 The third day in my Israel diary, where I’m attending the HP Indigo VIP Event in Tel Aviv. See Day 1 in Tel Aviv here, Day 2 in Jerusalem and Bethlehem here. Finally, I slept a complete night, and awoke feeling rested. I can’t recall how long it took my body to adjust last time I traveled to this part of the world, but I’m starting to feel a bit more alive. After a wonderful breakfast, I retreated to my room to write, respond to emails, and check on my wife and baby. All seems OK at home, except that Abby has been a bit more difficult that usual. I hope she doesn’t drive mommy crazy! On my agenda today is a visit to the HP Indigo offices in Nes-Ziona, to meet with Gershon Alon (he oversees the Workflow Solutions at HP Indigo) and further our integration with SmartStream (which we unveiled in Nashville a month ago), and discuss other cooperative goals. I struggle to find a taxi that will accept credit cards, and finally decide to take a cash-only cab and hope that we can find an ATM on the way. The driver speaks very broken English, but I gather he’s willing to help me find an ATM that works. After a few unsuccessful attempts, we finally find one that will accept my card (and accept my pin – I have a pin that is longer than 4 digits, which seems to be the extent of what most ATMs are able to accept here). 147 shekels later, we arrive at the Indigo office, and I jump out in front of 10 Einstein in Nes-Ziona. She places me in Gershon’s office, which I notice has two desks in it. It looks like one desk is a spare, and the other is where he makes the magic happen. His desk has a few papers, stapler, calendars, and other usual items laid about. On the second desk, a monitor is propped up on a box and a book titled “Printing Estimating, 4th Edition“, which makes me laugh. Not unlike what we use at our office. From down the hall, I can hear children playing and laughing. I’m intrigued; do people bring their children to work? Gershon later tells me that because of the upcoming holidays, some people bring their children to the office since they’re out of school. We spend the next few hours working through our agenda, meeting with a few others on Gershon’s team; at around, 2, we eat lunch in the busy Indigo cafeteria. Employees stream in and out, enjoying a wide selection of choices and engaged in conversation. I make my way back to the hotel around 4:00 PM, and I notice that it is a beautiful day outside. Since I’ve been indoors all day, I decide to go for a run on the boardwalk, heading north. As I run, I notice that the area looks like anything I might see in Santa Monica, and in fact, with the exception of a few people speaking Hebrew, it is difficult to pinpoint anything that distinguishes it from California. Amazing! Next on the agenda is a dinner with Elly Perets from Pageflex. Towards the end of last year, we announced integration with Pageflex (which we unveiled in Chicago at Graph Expo), and Elly has big a big part of the cooperation between our two companies. Elly manages the company’s goals for growth and market development, direct selling of all products, as well as the company’s relationships with OEM partners like Xerox and HP. Elly picks me up at 6:30, and we make our way to dinner. As we park at the restaurant, I notice Elly uses his phone to alert the city that he is parking. Instead of parking meters, they use a technology that allows you to check-in, enabling the city police to check your license plate and see if you’ve registered. When you leave, you check-out, and the amount you owe is debited from your balance. That’s pretty sweet – how come we don’t have that in the US? In addition, I notice that he has a keypad that requires a code before the car turns on. I ask why, and he says that unfortunately it is required due to auto theft, with stolen cars used by the wrong people to do the wrong things (think: car bomb). Our dinner is fantastic (as I am coming to find about all food in Tel Aviv), and we have a lively conversation about God, aliens, and time-travel. Yes, I know: that’s an odd combination of topics, but Elly has a broad scope of interests and experiences, and conversations flows from one topic to another. We also prepare for the next day’s agenda, during which I will spend a few hours at the Pageflex office in Caesarea reviewing our marketing automation platform and cooperation between our two companies. I’m back to the hotel by 9:00, and call my wife. Unfortunately, Abby is taking a nap so I can’t see her little face, but we talk for about 30 minutes and catch up on another wonderful day in Israel, and the day’s events back home. Lots of great technology developed here! Gershon adding an important date to the calendar; a right to left calendar none the less! Hmmm … for a blood drive I suppose? When I looked outside and saw this, how could I resist a run? This is a building I saw while on my run. A few days later, I learned that it was a nightclub, which unfortunately was hit by a bomber. They have never rebuilt it. This is the view from my hotel room, as the sun sets in the distance and goes to greet my wife and Abby!